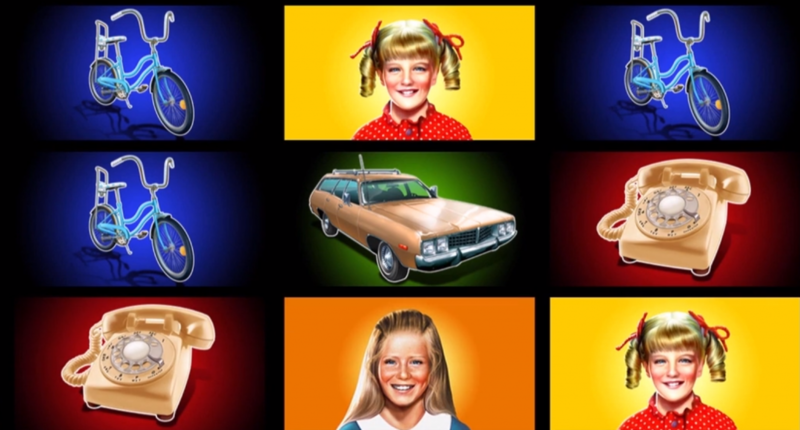 The Brady Bunch slot takes one of the most iconic TV shows from the 70’s and turns it into a fun, engaging slot that everyone who enjoyed the show, and even those who haven’t seen it can enjoy. The Brady Bunch stars Robert Reed and Florence Henderson as a recently married couple each with their own children who come together and learn to get along, all becoming part of the Brady family, constantly finding themselves undergoing silly adventures along with their housemaid Alice and their dog Tiger. 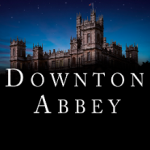 Although the show never became a big hit while it was on air, since syndication it has become a cult classic with several follow up movies and is now a household name. The Brady Bunch slot also contains a groovy looking Wild symbol which substitutes for all of the above base symbols in a winning combination, but only appears during the Groovy Wilds feature. Sunshine Day Free Spins and Hawaii Pick Bonus. If 3 Bonus symbols land on pay line 7, you will be awarded with either the Hawaii Pick Bonus or the Sunshine Day Free Spins Bonus which will be displayed on the 3 reels that triggered the bonus. Sunshine Day Free Spins. If the reels display Sunshine Day, 7 free spins will be awarded, and you will start off with a multiplier of 1x. When a Sunshine symbol lands, the bonus multiplier will increase by 1x for the rest of the free spins and grant another free spin. If two Sunshine symbols lands, the multiplier increase by 2 and another 2 free spins are awarded, with 3 symbols having the same effect but increasing both by 3. The maximum number of free spins is 31 and the maximum multiplier is 25x. Hawaii Pick Bonus. Here you must pick from 13 different surfboards to reveal a character that is shown with a credit reward multiplied by a multiplier. Collect 9 characters to win the Grand progressive and end the bonus, which can also be ended by collecting 3 Tikis. Progressives. The progressives are available at all bet levels. If one of each character symbol lands in the correct order (see below) during the base game, Peter Respin or Alice Respin, then the Major progressive is awarded. 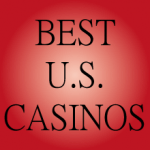 If the characters land in the right order during Sunshine Free Spins, The Grand progressive is awarded. This can also be awarded by finding all 9 characters in the Hawaii Pick Bonus. The prize increases as the bets increase. Brady Girls and Brady Boys. When one of each Brady Girl (or Brady Boy) symbol lands in the right order (see game rules), a flat pay is awarded. Wild does not substitute to create this pay, and it cannot be awarded on the same spin as a progressive win. If one of each Girl and Boy lands in the correct order, a higher flat pay is awarded. Marcia! Marcia! Marcia! During the base game spins, an animation may appear up top leaving 3-5 reel positions with Marcia symbols. A variable multiplier may be applied of 2x, 3x, 4x or 5x which is applied to the total award. Groovy Wild. During the base game, an animation may appear on top of the reels leaving 2-5 reel positions Wild. Alice Respin. This is triggered randomly by certain winning spins that contain the Alice symbol. Reels may spin up to 11 times, with each spin awarding equal to or more than the previous spin. Peter Respin. This works in exactly the same way as Alice Respin but is triggered by a winning spin that contains Peter rather than Alice. TV Pick Bonus. After any losing base game, the TV Pick Bonus can be triggered, awarding 3 picks at the start. You must pick from 12 TVs to reveal credit rewards, an extra 2 picks or a Bonus pick. 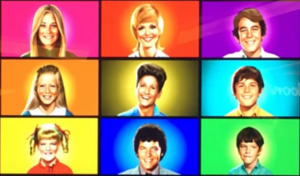 The Brady Bunch slot really is a lot of fun and just as silly as the TV series. I’m glad to see the Everi have included so many bonuses on this slot which are quite varied, especially considering the small 3×3 layout. There’s some big money to be had through the progressives, and plenty of smaller rewards through various other features to keep you going along. All in all, it comes highly recommended and reminds me a lot of Caddyshack slot which I also recommend.